The source lists delivered in this data release are intended as "general purpose" source lists. 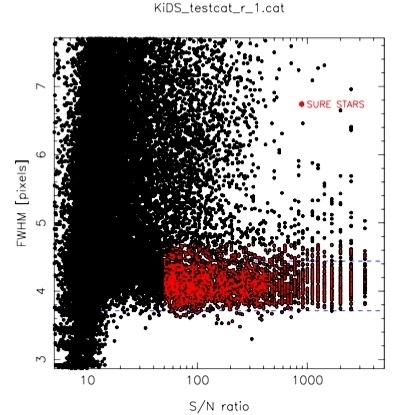 Source list extraction and star/galaxy (hereafter S/G) separation is done with an automated stand-alone procedure optimized for KiDS data: KiDS-CAT. This procedure, the backbone of which is formed by S-Extractor (Bertin & Arnouts, 1996, A&AS, 317, 393) performs the following steps. 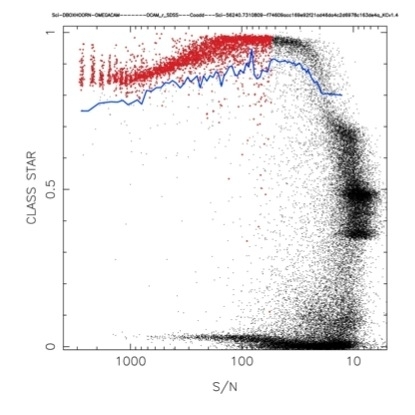 The contamination of the KiDS-ESO-DR1 source lists for unflagged sources is estimated to be <4% down to a SNR~5 within a 2 arcsec aperture (see the figure below). Ignoring all source extraction flags and masking, the corresponding spurious fraction increases to at most 10%. At very low SNR (<3), the spurious fraction increases dramatically, and we advise users of the source lists to filter out all sources below a SNR threshold of 3.0. The spurious fractions are determined through a comparison to the r-band data of the CFHT Legacy Survey, the main deeper survey overlapping with the current release (CFHTLS-W2, using their final data release T0007). For the analysis it is assumed that all KiDS sources not detected in CFHTLS-W2 are spurious. These values come with a caveat: they were only determined accurately in r-band and for a small area (< 1 sq.deg.). An internal estimate of the completeness for KiDS-ESO-DR1 source lists is provided, based on the method of Garilli et al. 1999 (A&A, 342, 408). It determines the magnitude at which objects start to be lost in the source list because they are below the brightness threshold in the detection cell. The implementation is similar to La Barbera et al. (2010, MNRAS, 408, 1313). Estimates of the completeness obtained by comparison to deeper CFHTLS-W2 data are consistent with these internally derived values. The distributions of the 98% completeness magnitudes for all tiles are shown in the data quality section. Comparison with the limiting magnitudes shows that the 98% completeness limits are typically ~1 magnitude brighter than the limiting magnitude for g, r and i and ~1.3 magnitudes brighter in u.
Spurious fraction in the r-band image of KiDS 135.0 -1.5 as a function of S/N in a 2 arcsec aperture. Dotted lines correspond to sources without flags, dashed lines to all sources. The colors differentiate between using a S-Extractor configuration with DETECT_THRESH= 2.5 (blue), 2.0 (red), 1.5 (black) respectively. For the official KiDS-ESO-DR1 release a DETECT_THRESH=1.5 is applied, but source lists with DETECT_THRESH=2.0 are also available.